Hi girls! It's a glorious Friday morning and I'm excited! I've been several shades of lazy and busy to go out lately so I've stored up all my appointments for this day. Call it streamlining operations - if there's anything I dislike, it's wasting time when there's a smoother way to accomplish things. Anyway, I just want to tell you about an upcoming workshop by Estee Lauder. 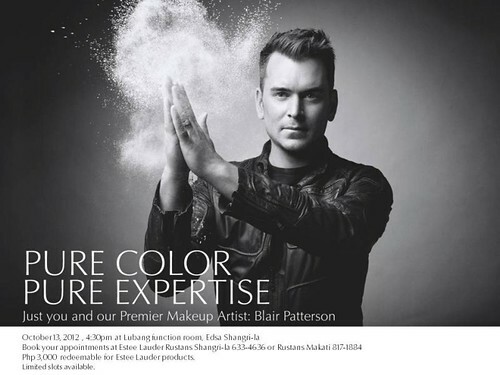 They are bringing in their Director of Global Makeup Artistry, Blair Patterson, to conduct the class! It will be held on October 13, 4:30pm at the Lubang function room of EDSA Shangri-La. Sounds fab right? All you need to do is reserve and pay the P3,000 workshop fee, which is in reality consummable GCs at Estee Lauder. ;) Aside from learning from one of the top makeup artists abroad, you also get to treat yourself to new EL goodies. Try the Idealist Cooling Eye Illuminator, the Pure Color Lipstick, and/or the Stay in Place Eye Pencil. They're some of my fave Estee Lauder products other than the Advanced Night Repair Concentrate. Get to know more about Blair here. Director, Global Makeup Artistry, Blair Patterson, visits the fashion capitals throughout Asia, Europe, the Middle East, Africa and North and South America where he educates the brand’s top Makeup Artists, supports key press tours and meets with beauty editors. He travels the world educating women on how to look beautiful in a few simple steps. During New York and Paris Fashion Weeks, Blair works closely with Tom Pecheux, Creative Makeup Director for Estée Lauder. 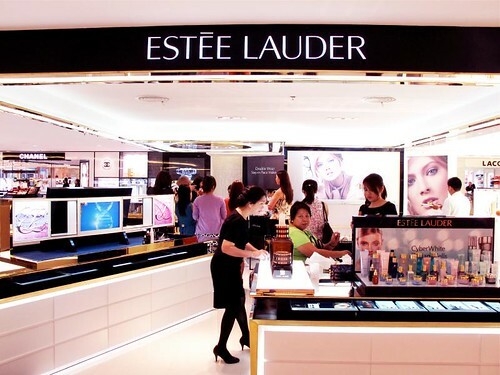 They also work together with brand spokesmodels Liu Wen, Constance Jablonski, Joan Smalls and Hilary Rhoda for all major photo and video shoots, press announcements and tours to promote Estée Lauder’s Pure Color Makeup around the world. Blair’s work is frequently featured on TV on The Today Show, The View, The Food Network, E! and TLC, as well as in print for Vogue, Harper’s Bazaar, Elle Magazine, Vanity Fair, Cosmopolitan and other publications. Recently he was a huge success on QVC promoting the brand’s launch of Cooling Eye Illuminator. Blair also has a fast-growing presence in the beauty and fashion blogosphere. One of his biggest hits to date has been a live chat with popular Cupcakes and Cashmere blogger Emily Schuman.